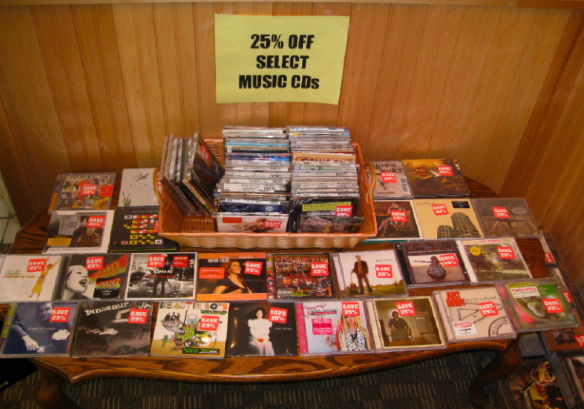 I mentioned recently that the old neighborhood bookstore has a table dedicated to music CDs that are on sale for up to 25 percent off. While I was in the store over the weekend, I noticed it’s become more difficult to see the top of that table. In order to make room for the ever-expanding selection of music, the store has placed even more titles on sale for cheap, cheap, music-to-your-ears cheap. I snapped this photograph but, as you can see, you’d need to stop by to check out each offering for yourself. Of course, this is while supplies last. So stop by soon and you just might be able to pick up a favorite tune. Hey, I’m a poet even if you didn’t know it.